After four years of active implementation, CIRDI’s Co-Laboratorio Peru Project (Co-Lab Peru) came to a close this fall. Delivered by a team led by June Francis and Kristina Henriksson based at Simon Fraser University (SFU), this project worked with diverse stakeholders and partners to ensure that the sustainable development of Peru’s natural resources would generate lasting and inclusive benefits for women, men, girls and boys. You can read more about the Co-Laboratorio Peru project here. Among the project’s successes was their work with women, which aimed to increase the visibility of women’s voices and perspectives, enhance their capacity in leadership and strategic planning, and increase access to knowledge and information for and with women. In Peru, a significant number of women working in the mining sector or living in mining communities still face discrimination in access to decision-making and economic resources, and remain victims of sexual abuse and violence. The empowerment of women, decrease in gender gaps and mitigation of stereotypes are vital for the sustainable economic development of Peruvian mining communities. Women and men in Peru have come together to address this head-on, with the 2016 “Women and Mining Agenda” a particularly valuable tool for increasing visibility around the impacts of mining on women, alongside proposed solutions. 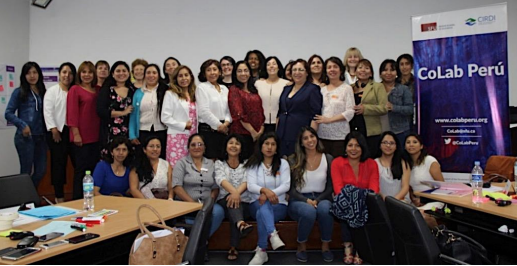 Using the “Women and Mining Agenda” as an entry point for discussion and learning, the Co-Lab Peru team, in collaboration with Grupo de Dialogo and the Centre for Conflict Analysis and Resolution (CARC) of the Pontifical Catholic University of Peru, held a series of Women Leadership Circles and Learning Sessions. These sessions were designed to be inclusive and representative in order to foster resilient solutions. Participants included delegates from civil society, local and national government, industry and academia, and represented different mining communities and stakeholder groups. Together, women participants designed their own learning path at the outset of the program, with the ultimate aim of amplifying their voices, visibility and access to resources, and increasing their capacity for leadership and strategic planning. Peer-to-peer learning was central to these sessions, as women active in promoting gender equality within the context of the mining sector had the opportunity to exchange their perspectives and experiences. These discussions advanced the knowledge and understanding of the group as a whole and allowed participants to identify new perspectives, opportunities and approaches to empowering women within their own communities. CIRDI understands that women are working towards an inclusive mining sector that takes into account their needs and aspirations. Women require support as they work towards this, in order to overcome the systemic barriers they face in influencing change. For this reason, CIRDI’s Co-Lab Peru Project provided strategic support to Peruvian women as they themselves work towards change in their communities. CIRDI would like to thank the SFU Peru Co-Lab team which implemented this project, as well as all the partners and stakeholders who supported and participated in this work.